The U.S. death toll from Takata airbags has increased to 12. According to a New York Times report, Ramon V. Kuffo, 81, of Miami, was using a hammer to work on his 2001 Honda Accord when the driver's side airbag exploded. Kuffo's car had been included in one of the many Takata recalls, but a Honda spokesperson told the Times the recall was never completed on his car. The 2001 Accord has one of the most dangerous airbags, with as much as a 50 percent chance of exploding in a crash, the Associated Press reported. Florida, where Kuffo lived, is seen as Ground Zero for Takata airbags because of its high heat and humidity, which makes the defective Takata inflators more volatile. Kuffo died in June but news of the incident is just becoming available, following a report from the medical exminer, who ruled that he died of accidental head trauma. Kuffo's death brings the worldwide death toll to 17. More than 180 people have been injured in the United States alone. The Takata airbag recall is the largest in U.S. history, affecting more than 42 million vehicles, not counting another 2.7 million that were identified this week. Takata recently declared bankruptcy, leaving carmakers potentially stuck for billions of dollars in recall-related expenses. 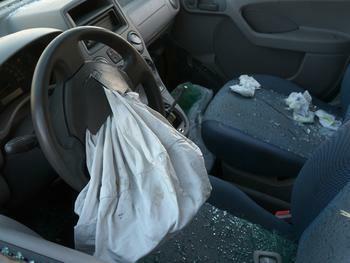 More than 65 percent of the recalled airbags are still in service, meaning that millions of consumers are driving around with a potentially explosive device just inches from their face. Is your car included in the recall? You can find out by jotting down your VIN number and going to the U.S. government's SaferCar.gov.